The CRISPR-Cas9 gene-editing system allows scientists to permanently alter the human genome faster and more precisely than ever before (see Sep 2014 news; May 2016 news). What if scientists wanted to make a temporary change, by targeting RNA instead? In the October 25 Science, researchers led by Feng Zhang of the Broad Institute of MIT and Harvard report that a modified CRISPR system does just that. Called REPAIR, it seeks out and binds RNA sequences to replace a targeted adenosine with inosine, which in RNA functions like guanosine. To be sure, REPAIR and other RNA-editing systems have a way to go before clinical application, but they may one day correct disease-related mutations at the mRNA level, including those that cause neurodegeneration (see October 2017 news). “This is like using the ‘find and replace’ function of a word processor to correct RNA typos,” Zhang wrote to Alzforum. He noted that making changes at the level of RNA gets around some of the challenges of editing DNA. For instance, because post-mitotic neurons do not divide, they don’t activate all of the DNA repair machinery on which the CRISPR-Cas9 system relies. Instead, scientists have turned to adeno-associated viruses to deliver genes for Cas9 into neurons, including those in the J20 mouse model of AD. Using this viral version of CRISPR to splice the sequence for a green fluorescent protein into the gene for the structural protein β-actin, researchers led by Ryohei Yasuda and Takayasu Mikuni at the Max Planck Florida Institute for Neuroscience, Jupiter, confirmed that these mice have fewer synapses than non-transgenic controls (Nishiyama et al., 2017). “Site-directed RNA editing is an exciting technology with many potentially useful applications for research and therapy,” said Thorsten Stafforst, University of Tuebingen, Germany. It follows several attempts by Stafforst’s and other labs to develop RNA editors (Vogel and Stafforst, 2014; Montiel-González et al., 2016; Wettengel et al., 2017). For all systems, including this one, the editing still has to get more efficient while limiting off-target editing, Stafforst noted. In other CRISPR news, David Liu and colleagues at the Broad Institute have developed a new DNA-editing technique to convert A•T pairs to G•C pairs without creating a double-strand break in the helix. In bacteria, CRISPR uses small RNAs to guide an endonuclease to complementary sequences on foreign DNA, whereupon it creates double-strand breaks to destroy the invader. Last year, Zhang’s group discovered a unique CRISPR enzyme in the Leptotrichia wadei bacterium called Cas13. Unlike most known CRISPR nucleases, Cas13—formerly known as C2c2—digests RNA instead of DNA (Abudayyeh et al., 2016). 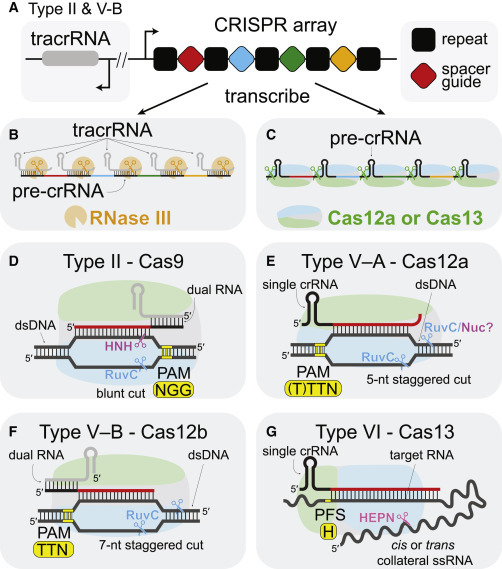 Some engineering tweaks enabled Zhang and colleagues to use Cas13 to knock down or track RNA as it moved through the cell (Abudayyeh et al., 2017). In this paper, the researchers report how they modified the CRISPR-Cas13 apparatus to repair RNA copies of gene mutations in mammalian cells. They used guide RNAs to target a nuclease-dead Cas13 with high affinity for ribonucleic acid to sequences they wanted to modify. A deaminase domain spliced onto the Cas protein, then converted specific adenosines to inosine. Co-first authors David Cox, Jonathan Gootenberg, and Omar Abudayyeh assayed a variety of Cas13 family members to find that Cas13b, from the Prevotella sp. P5-125 bacterium, cleaved RNA most efficiently in mammalian HEK293 cells. They generated a catalytically dead version of this enzyme (dPspCas13b) that would not cut any RNA it bound. The idea was to use dPspCas13b to improve target recognition and stringency relative to other RNA editors, which rely on RNA-RNA hybridization. Onto this dead nuclease, the researchers tacked the deaminase domain of adenosine deaminase acting on RNA 2 (ADAR2). Primarily expressed in human neurons, ADAR2 acts on RNA duplexes formed during post-translational modification, plucking amino groups from adenosine nucleosides and converting them to inosine. ADAR2 preferentially alters adenosines that are erroneously paired with cytidines (Wong et al., 2001). The researchers designed Cas13b guide RNAs to target RNAs they wanted to edit, but in place of a thymine, they used a cytidine to complement the adenosine to be deaminated (see image above). The attached ADAR2 domain then corrected the mismatch, replacing the adenosine on the target RNA with inosine. They dubbed this machine REPAIR, short for RNA Editing for Programmable A to I Replacement. Initially, REPAIR’s performance was mixed. In HEK293 cells, it restored fluorescence in a reporter protein by switching a mutant A to G and removing a premature stop codon. Cox and colleagues then corrected 36 disease-related G to A mutations, some linked to Parkinson’s disease and amyotrophic lateral sclerosis. However, efficiency varied from zero to 35 percent and the system made thousands of off-target A to I changes throughout the transcriptome. Stafforst noted that these mutated proteins were all overexpressed in reporter constructs, so the editing yield under physiological conditions may be even lower. To improve this, the researchers mutated ADAR2 to deaminate more readily and loosen its grip on RNA. While deaminase efficiency of this REPAIR version 2 remained low, at 20 percent, it made virtually no off-target modifications when used to edit endogenous mRNAs for two common proteins, PPIB and KRAS. The Cas-driven recognition may provide another level to control affinity and selectivity, or stabilize the guide RNA from cellular nucleases, wrote Peter Beal, University of California, Davis, to Alzforum. However, compared with other ADAR-based RNA editing systems, Cas is large and could be difficult to deliver to cells therapeutically, he said. Because this system targets RNA transcripts rather than DNA, its effects are reversible, wrote the authors. “Systems that create DNA mutations lead to permanent changes to the genome, which may not be desirable in all cases and, in fact, may be dangerous if the genomic editing reagent isn’t perfectly selective for its target site,” wrote Beal. RNA editing may also enable researchers to tackle temporary problems, such as bouts of inflammation. Zhang and colleagues speculate that REPAIR could be used to tweak disease-related proteins. For instance, it could modify kinase targets to be more or less phosphorylatable. Developing drugs for specific kinases has been notoriously difficult because many of them share a similar catalytic mechanism. While REPAIR is currently limited to correcting adenosines, CAS13b could also be combined with catalytic RNAs that convert cytidine to uridine, wrote the authors. Stafforst estimated that the editing efficiency of this system is probably too low for immediate research or clinical benefits. Perhaps the modified ADAR2 could be transferred to the other RNA editing systems, he suggested. In the spirit of expanding a CRISPR’s repertoire of possible base changes, Harvard scientists led by Liu have now built on their previous discovery that they could change G•C to T•A base pairs on DNA using CRISPR-Cas9 (see May 2016 news on Komor et al., 2016). In an October 25 Nature paper, they described how they developed and attached an adenine base editor to the CRISPR-Cas9 system, enabling T•A to G•C replacements. They can now use this, together with their previous editor, to correct any single-base variant on DNA. Gaudelli NM, Komor AC, Rees HA, Packer MS, Badran AH, Bryson DI, Liu DR. Programmable base editing of A•T to G•C in genomic DNA without DNA cleavage. Nature. Published online 25 October 2017. PubMed. Nishiyama J, Mikuni T, Yasuda R. Virus-Mediated Genome Editing via Homology-Directed Repair in Mitotic and Postmitotic Cells in Mammalian Brain. Neuron. 2017 Oct 18; PubMed. Vogel P, Stafforst T. Site-directed RNA editing with antagomir deaminases–a tool to study protein and RNA function. ChemMedChem. 2014 Sep;9(9):2021-5. Epub 2014 Jun 20 PubMed. Montiel-González MF, Vallecillo-Viejo IC, Rosenthal JJ. An efficient system for selectively altering genetic information within mRNAs. Nucleic Acids Res. 2016 Dec 1;44(21):e157. Epub 2016 Aug 23 PubMed. Wettengel J, Reautschnig P, Geisler S, Kahle PJ, Stafforst T. Harnessing human ADAR2 for RNA repair – Recoding a PINK1 mutation rescues mitophagy. Nucleic Acids Res. 2017 Mar 17;45(5):2797-2808. PubMed. Wong SK, Sato S, Lazinski DW. Substrate recognition by ADAR1 and ADAR2. RNA. 2001 Jun;7(6):846-58. PubMed. Murugan K, Babu K, Sundaresan R, Rajan R, Sashital DG.The Revolution Continues: Newly Discovered Systems Expand the CRISPR-Cas Toolkit. Mol Cell. 2017 Oct 5;68(1):15-25. PubMed.